As specialized United Nations agency, UNESCO deploys its action in the fields of Education, Natural Sciences, Social and Human Sciences, Culture, Communication and Information. Founded in 1945, UNESCO is today composed of 191 Member States. Think about places as unique and diverse as the wilds of East Africa's Serengeti, the Pyramids of Egypt, the Great Barrier Reef in Australia and the Baroque cathedrals of Latin America. Those sites make up our world's heritage and deserve our protection. This is why UNESCO seeks to encourage the identification, protection and preservation of cultural and natural heritage around the world considered to be of outstanding value to humanity. For more information check out the SEOS tutorial on Module 2 - Conservation of natural and cultural Heritage. 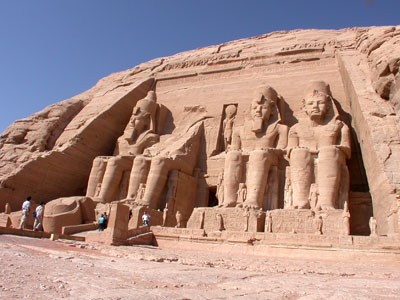 The World Heritage site of Abu Simbel, Egypt. Photo: WHC UNESCO. You can also visit the educative website Remote Sensing in Support of World Heritage Conservation and have a look at the list of World Heritage Sites.